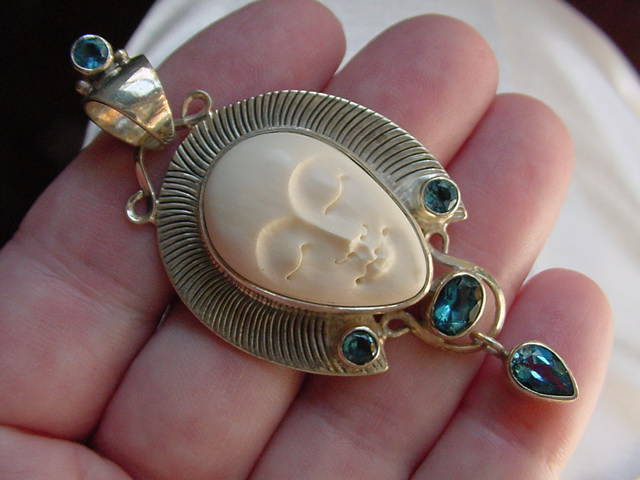 ALSO LOOK ON the ALASKA pages for IVORY CARVINGS and ARTIFACTS! 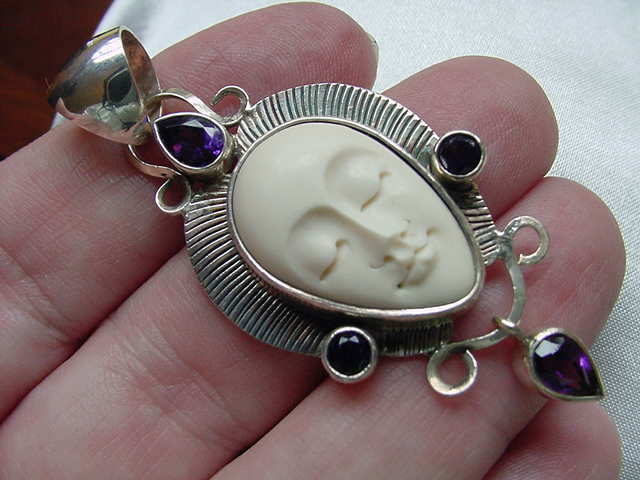 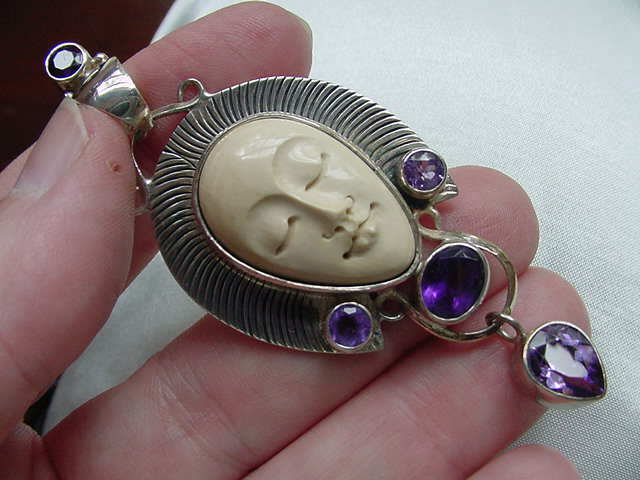 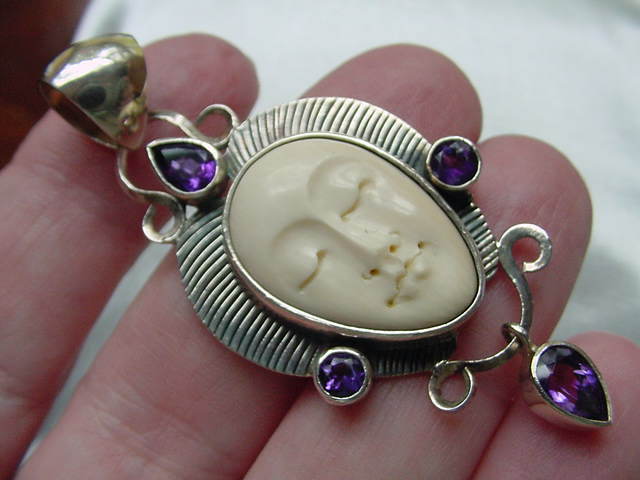 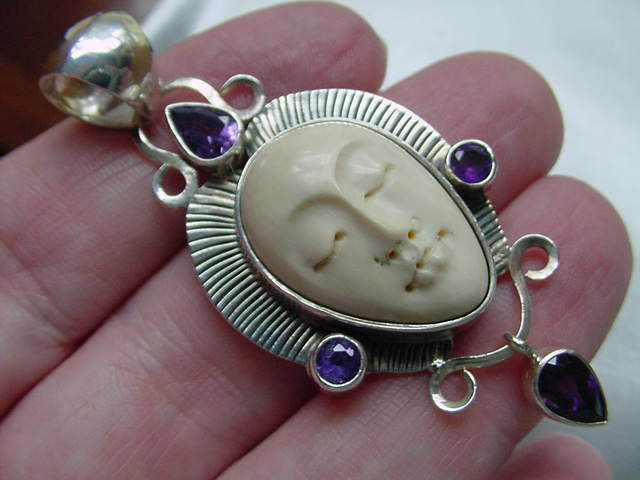 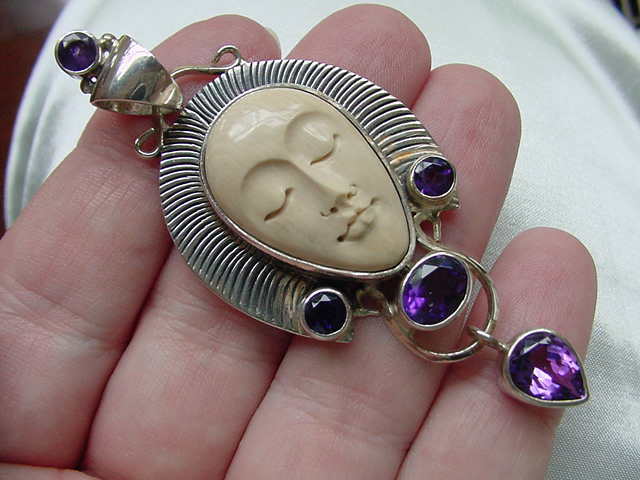 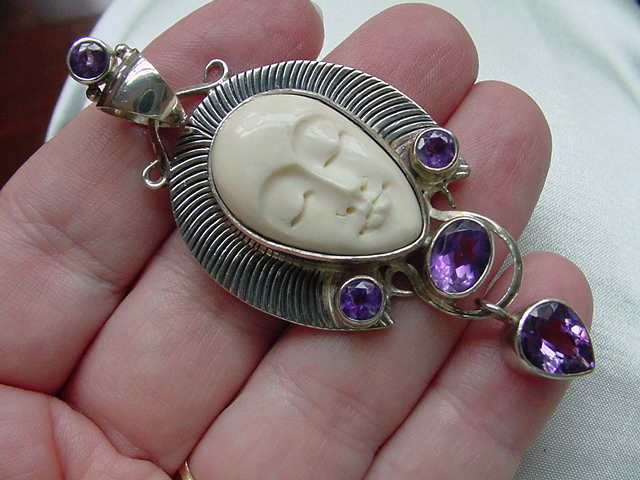 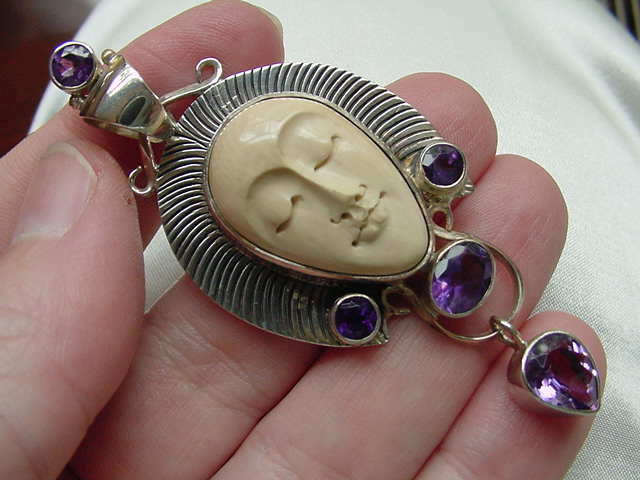 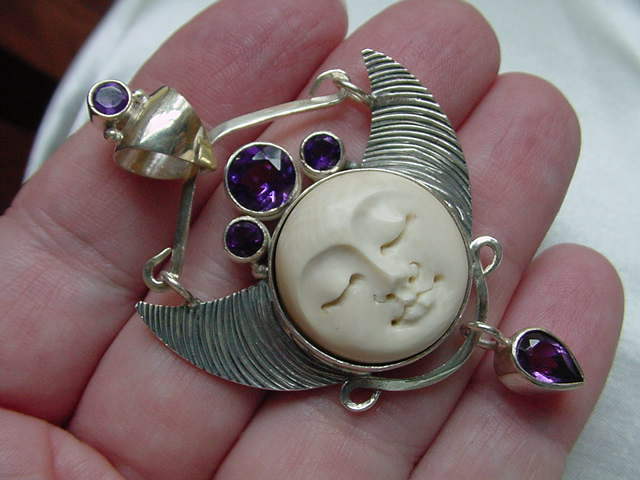 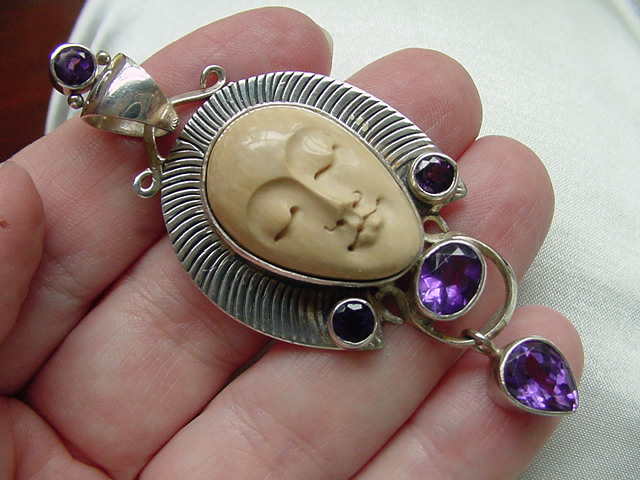 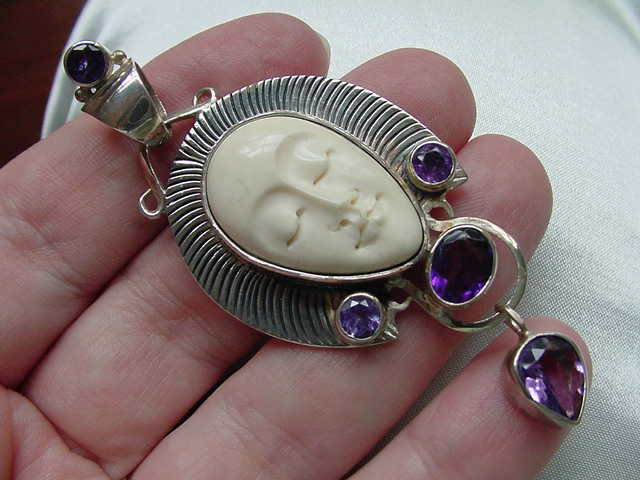 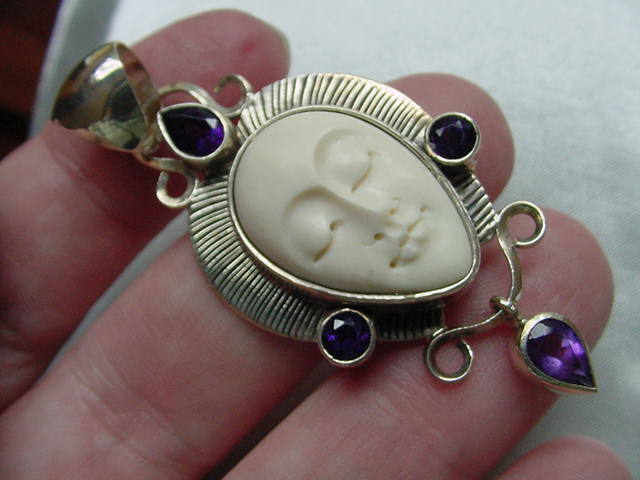 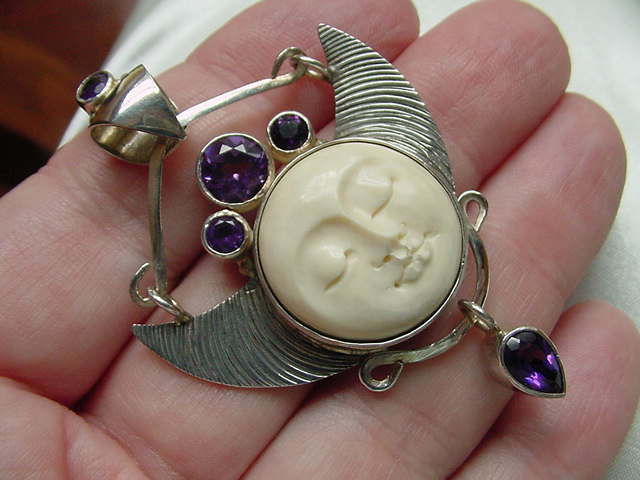 This is Genuine Fossilized WOOLLY MAMMOTH ivory (10,000 years old) from Alaska, carved by artisans in Bali, and set in sterling silver and set with precious stones of Boulder blue opal (Australia), purple amethyst (Brazil), blue topaz, peridot, and/or South Seas salt water cultured pearls. 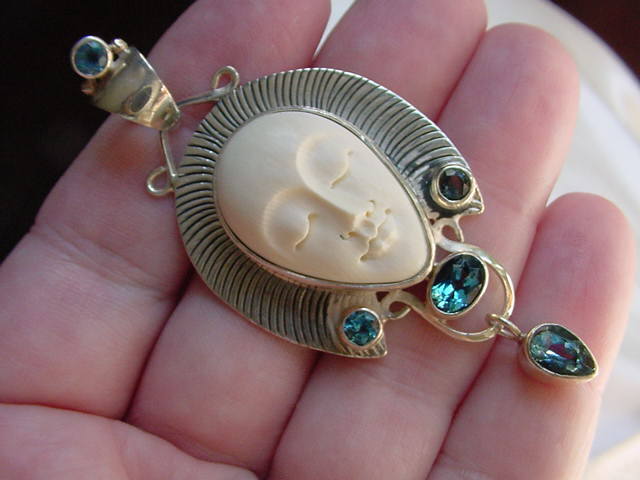 Natural differences in the color of the ivory, and the carving of the faces, and the color and sparkle of each gem is different enough to make each one unique! 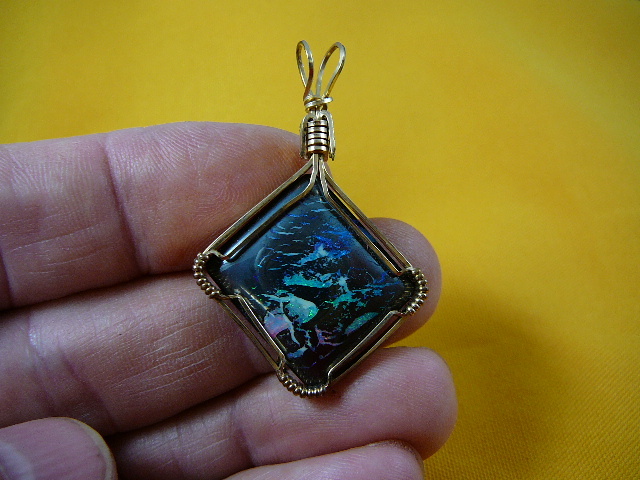 Top loops allow for a generous size necklace chain or collar. 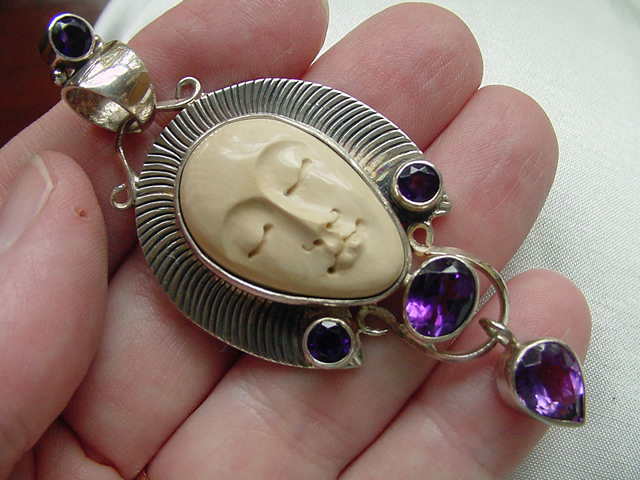 Look on Necklaces page 5 for suggestions. 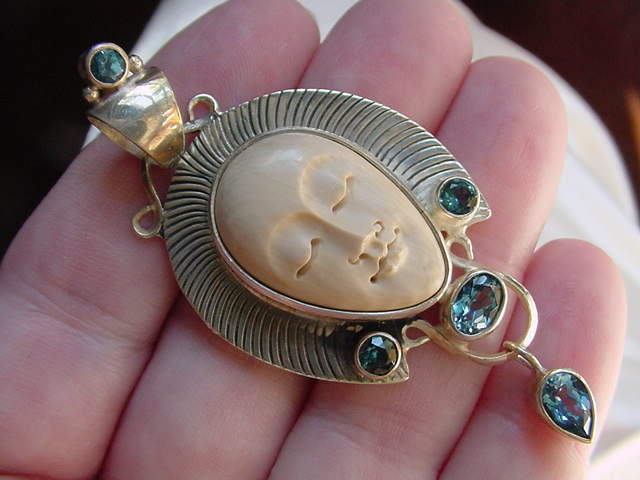 #O-90. 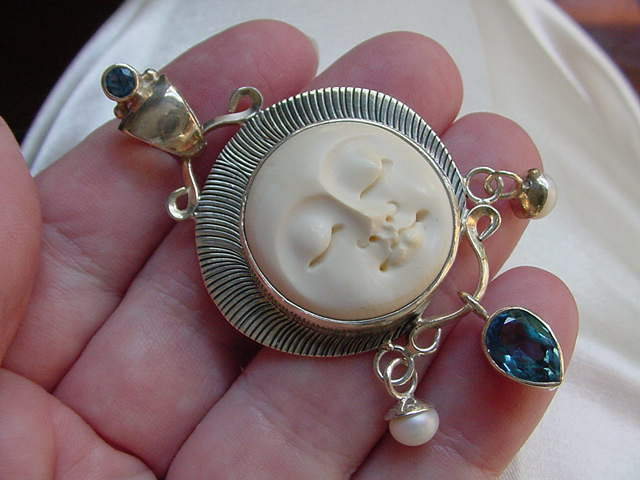 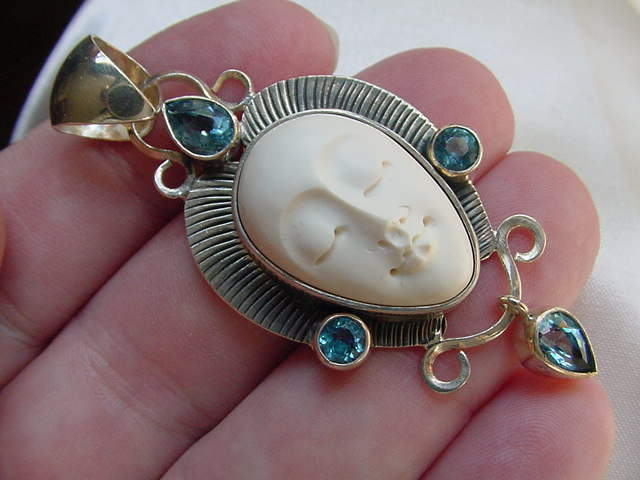 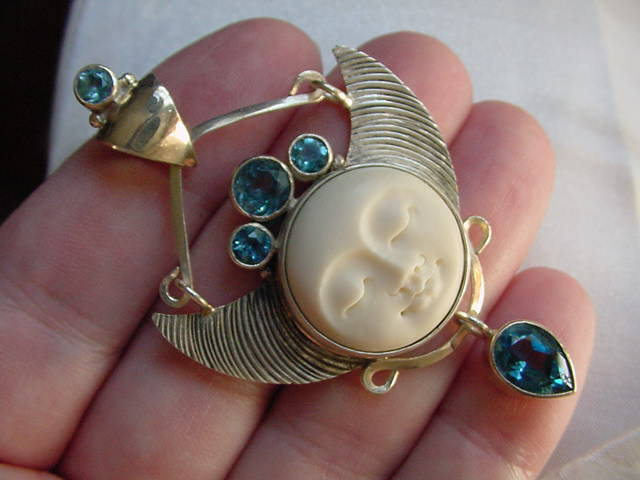 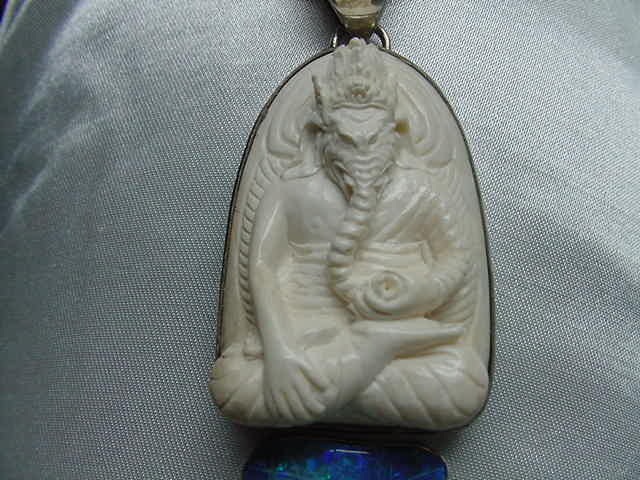 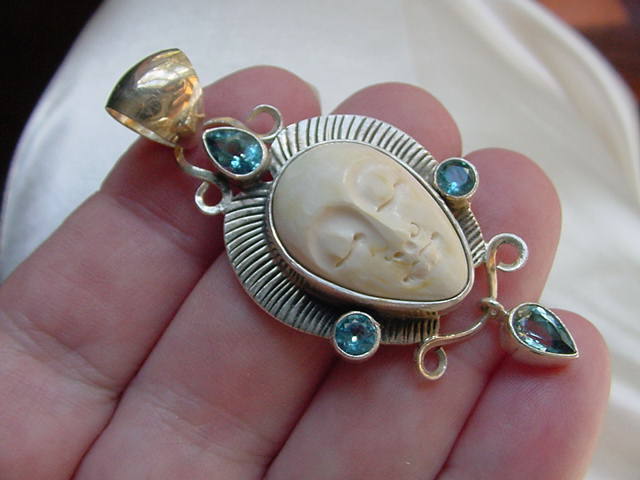 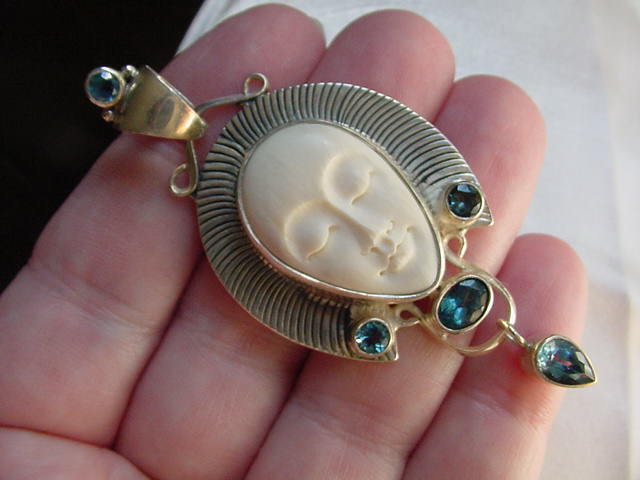 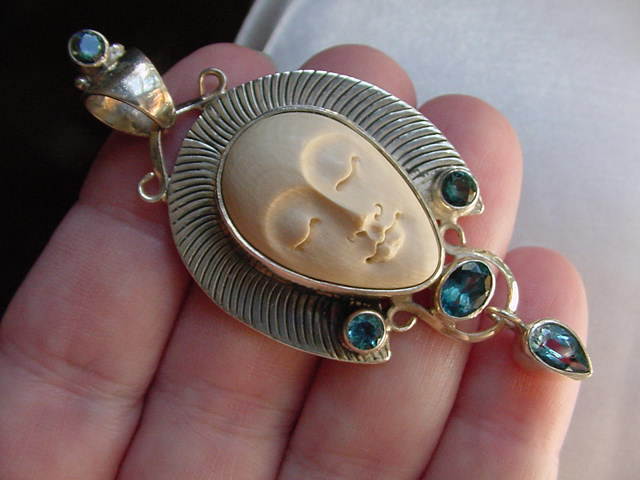 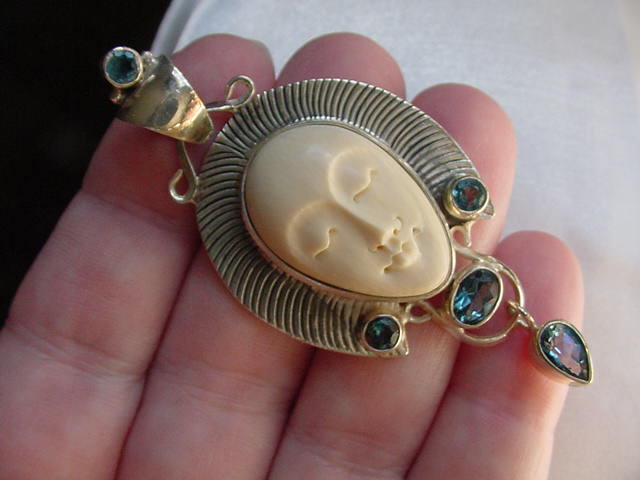 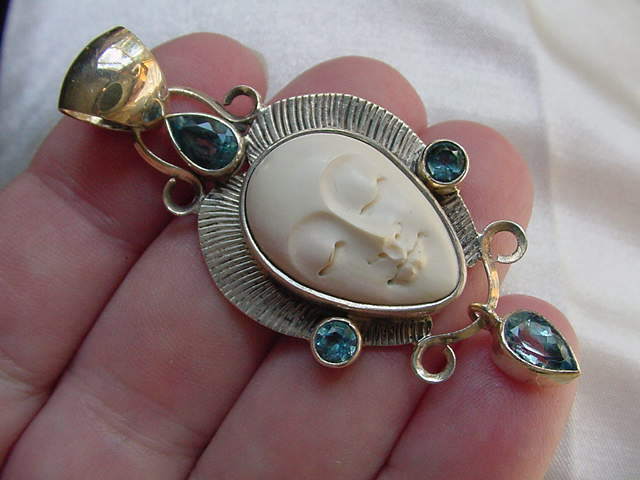 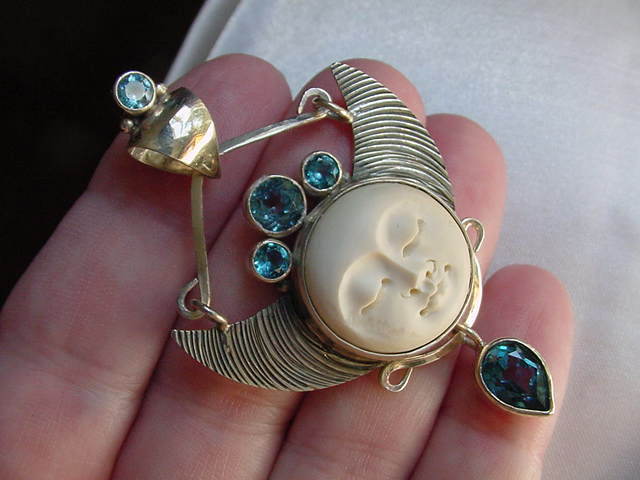 Ganesha (or Ganeesh), fossil woolly mammoth ivory carving with triple blue boulder opals set in sterling silver as a pendant. 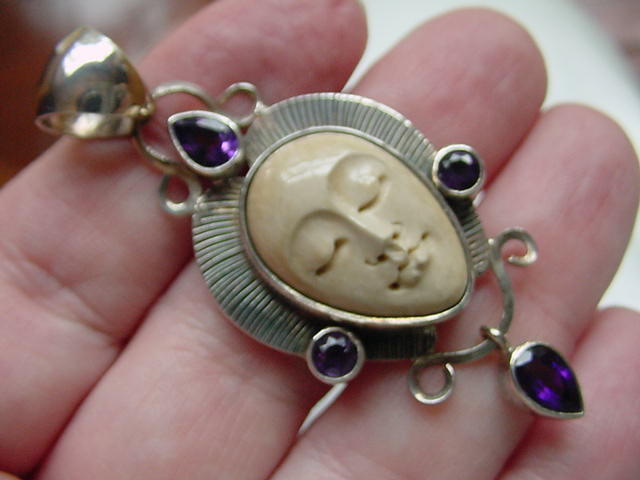 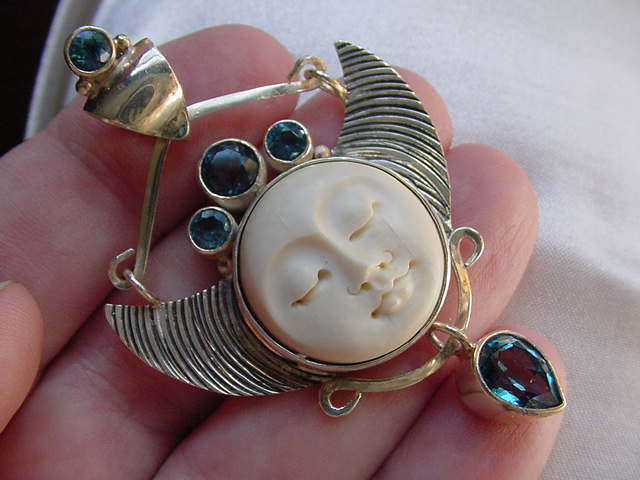 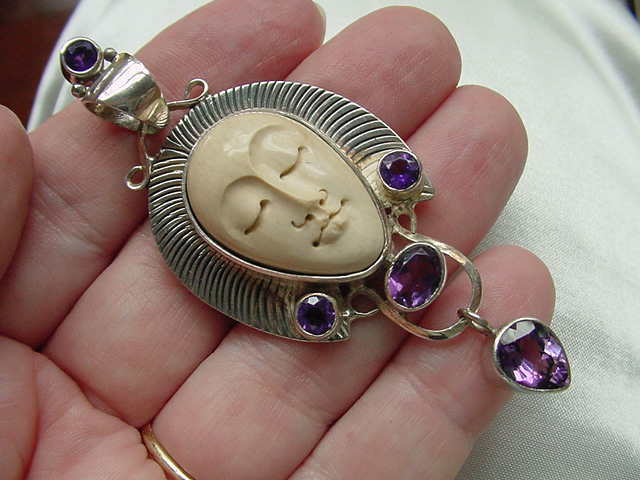 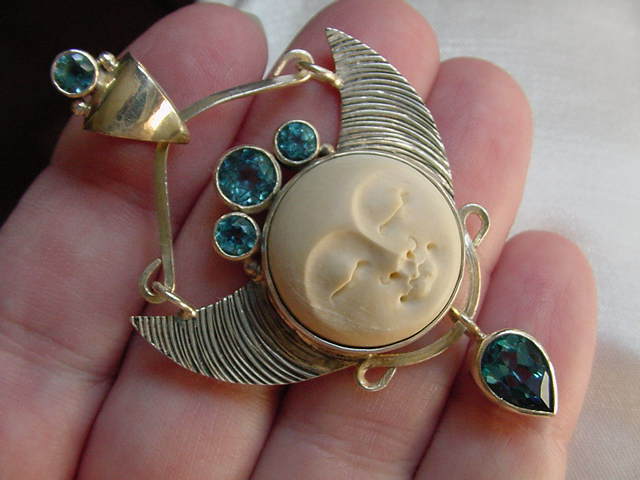 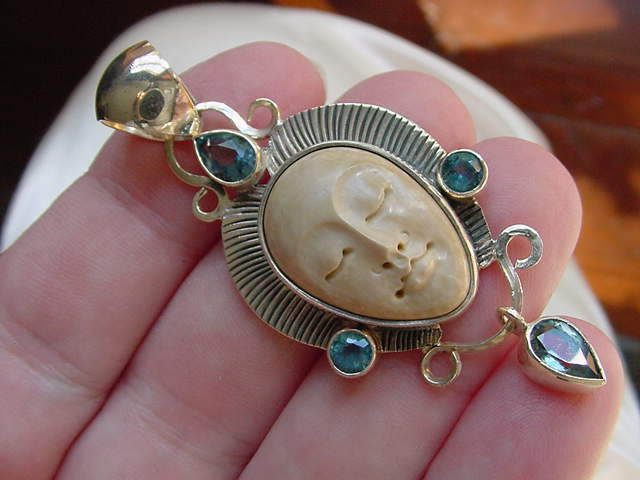 Full pendant including bail is 3 1/4" long, of which the Ganesha is 1 3/4" and the opals are 1" long x 7/8" wide graduating to 5/8" wide. 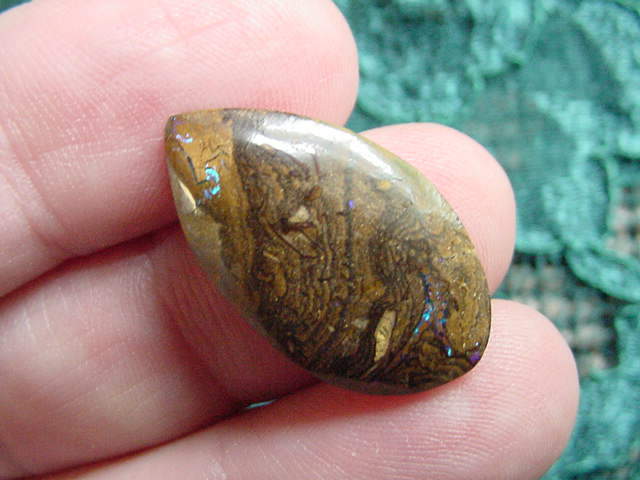 The largest opal has a flaw line straight across the middle, but which cannot be felt on the surface. 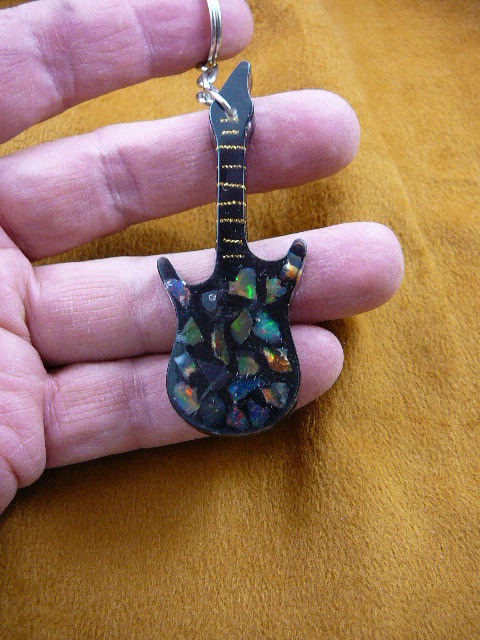 An awesome choice. 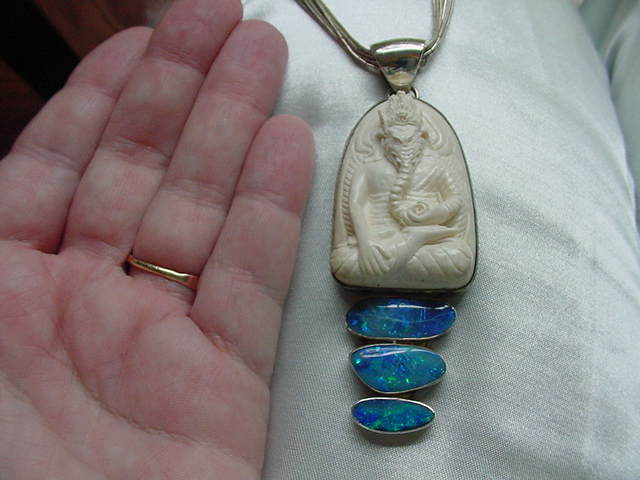 This is a group of "Yowah Opals" named for the town in Australia where these opals are mined. 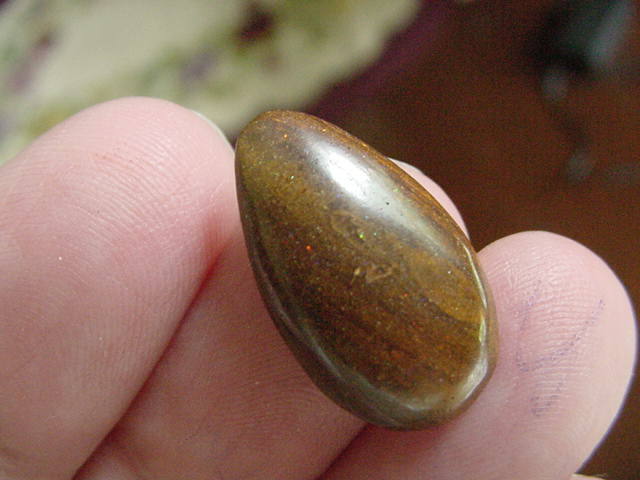 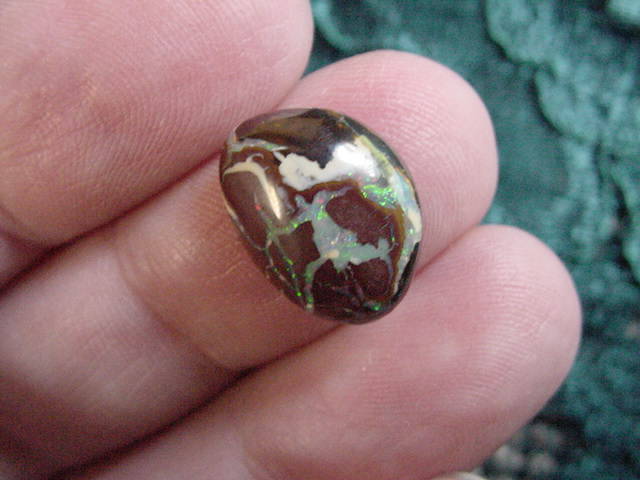 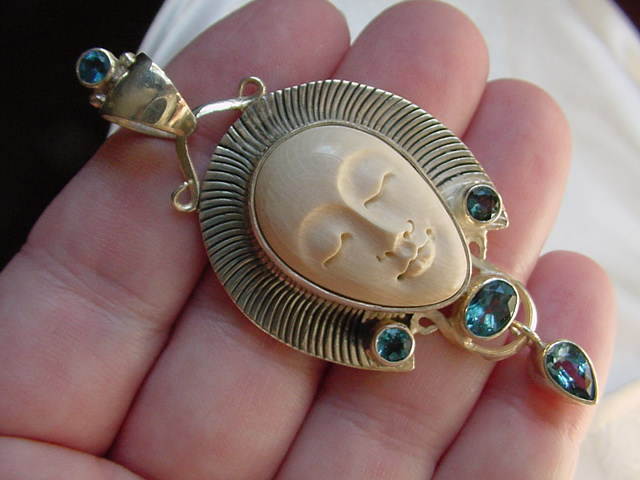 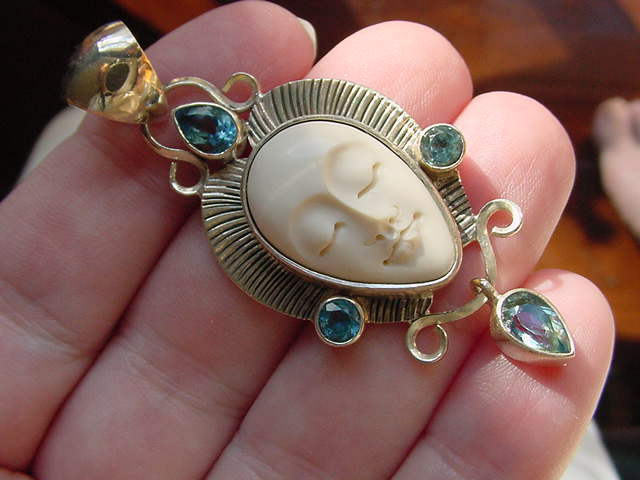 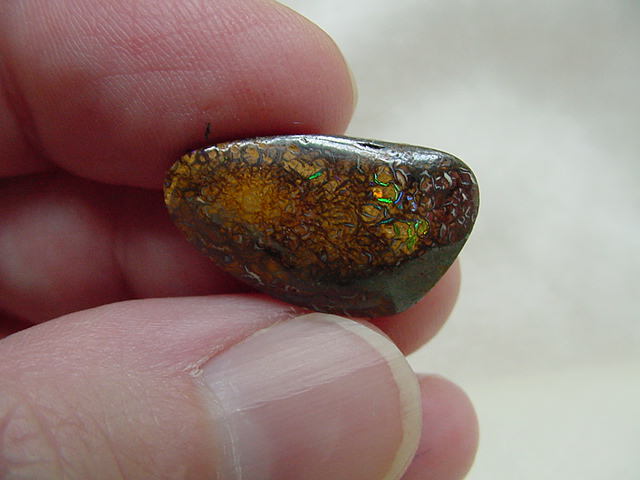 The brown you see is the stone matrix, with the beautiful blue, green, red and yellow opal showing through in lines of lightning and a shimmer of sparkle in many different ways. 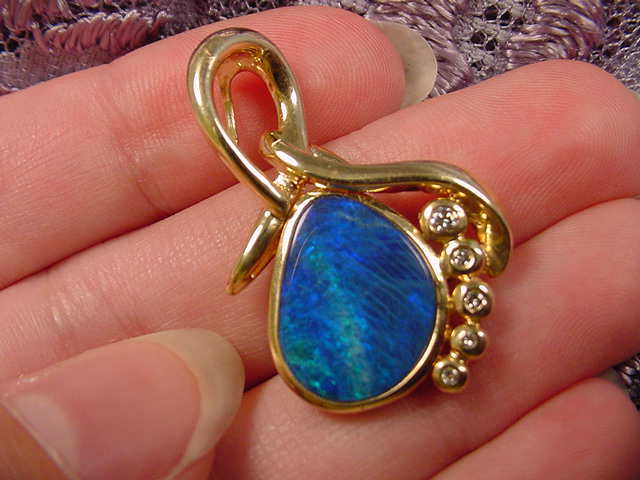 It is one of the hottest new types of opals coming on the market, and we were among the first to carry it! 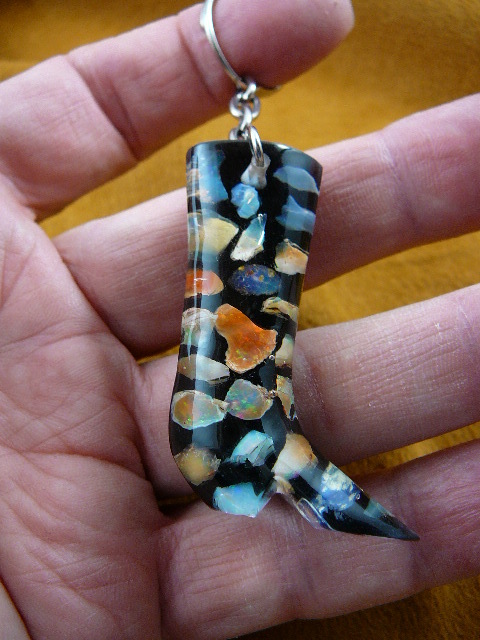 Purchased directly from the miners in Aussieland. 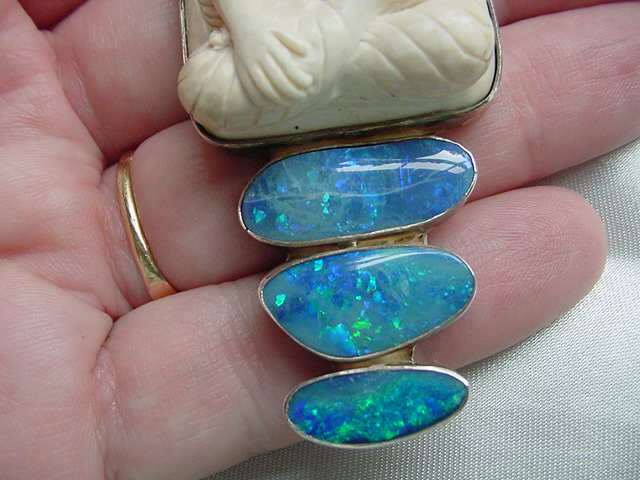 Measurements are from top of bale (loop) to bottom of opal. 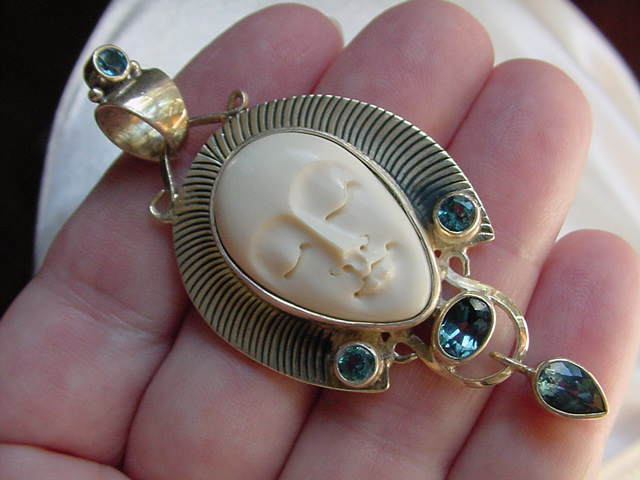 These are all pendants in gold-filled wire. 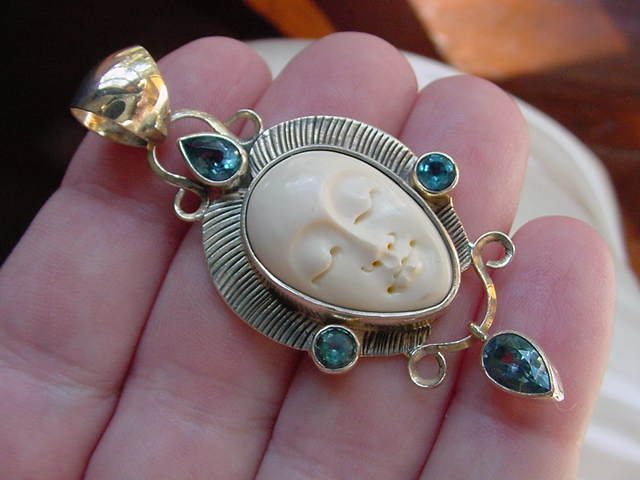 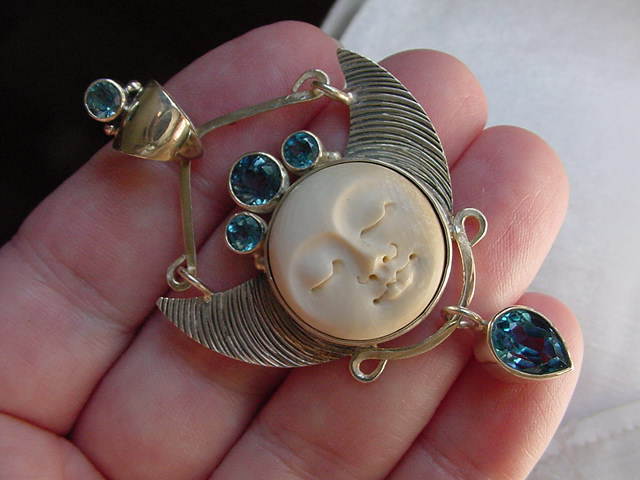 Make your own jewelry or collect as beautiful specimens. 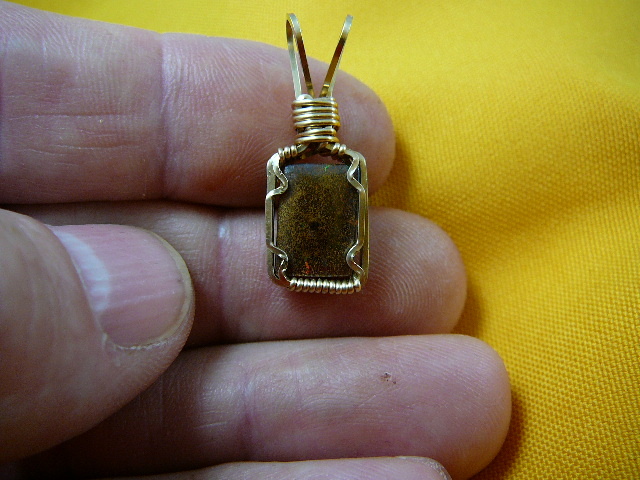 Wire it yourself, or take to your favorite jeweler for setting in precious metals. 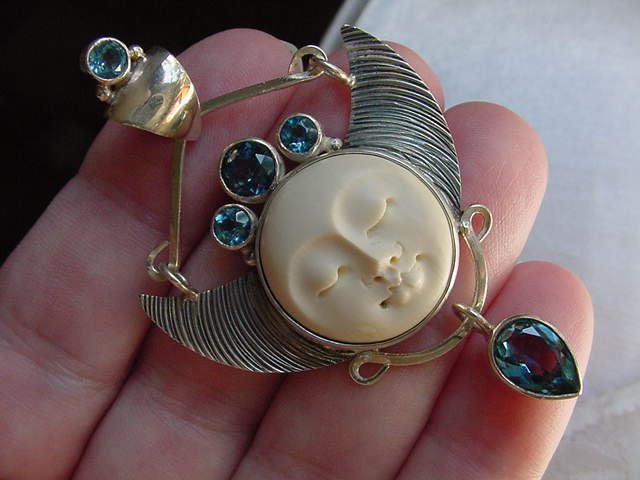 These are free forms (no calibrated measurements for set sizes). 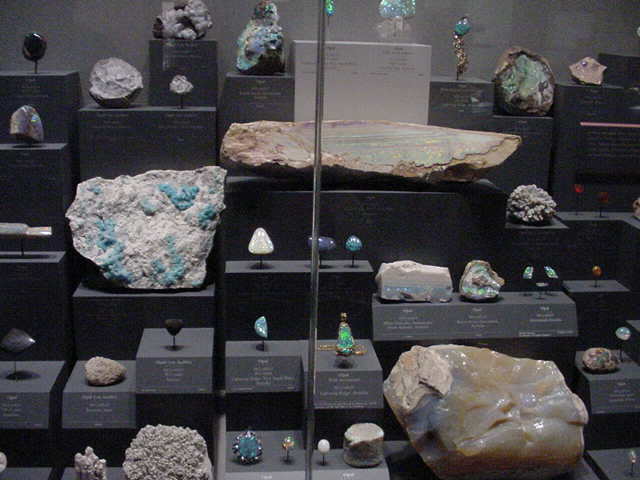 Mined from Australia. 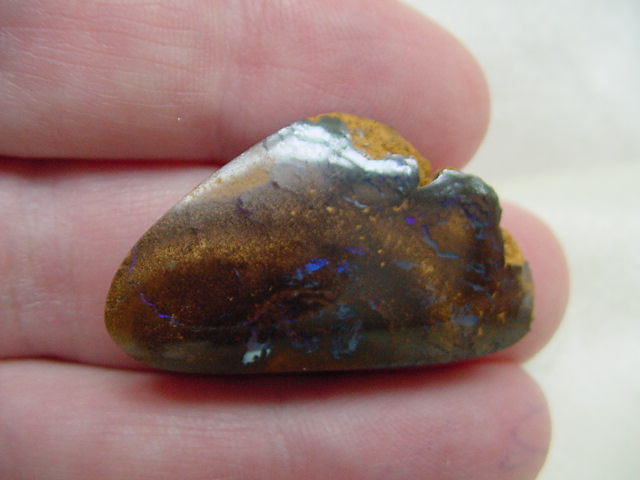 These natural slices of opal have a typical lovely blue color, attached to another piece of natural ironstone; called a doublet. 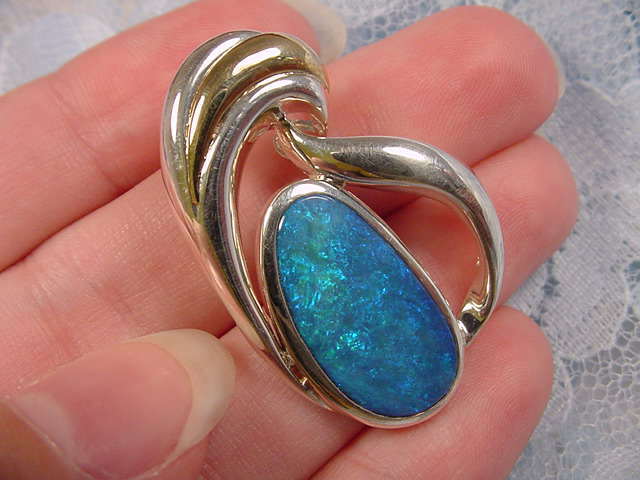 (Notice one wave or center of triple wave is 14k gold; versatile to wear with other gold OR silver jewelry) These natural slices of opal have a typical lovely blue color, attached to another piece of natural ironstone; called a doublet.